As you probably read on the Dot yesterday Okular doesn’t support much of ODF. I remembered that Jos had created the Slidecompare tool, so I got the idea to combine it with an Okular generator. It turned out that it’s pretty easy to combine the ends from both worlds. Okular offers a very nice API to write generators, which is almost an exact match to the KOffice one. 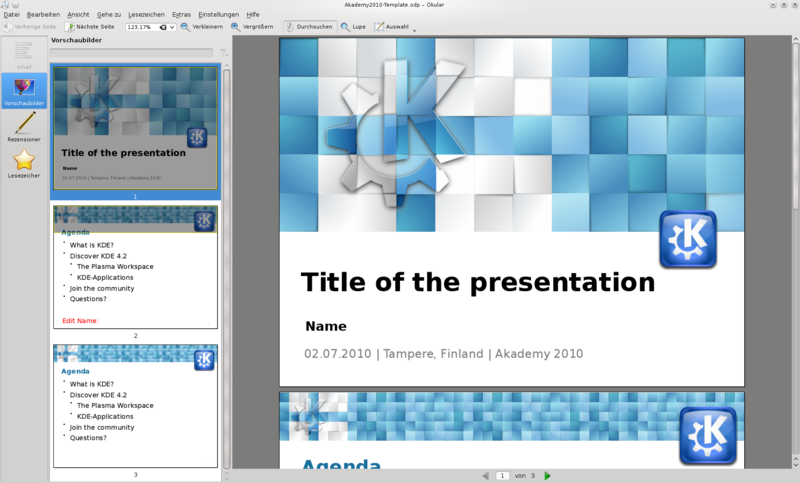 The generator currently supports only formats supported by KPresenter: ODP, PPT and PPTX. Currently only rendering is supported (so no search). The generator is now in KOffice trunk. Even though it’s just 107 lines of code, it can make use of all the work that went into the KOffice import filters. I love integration! 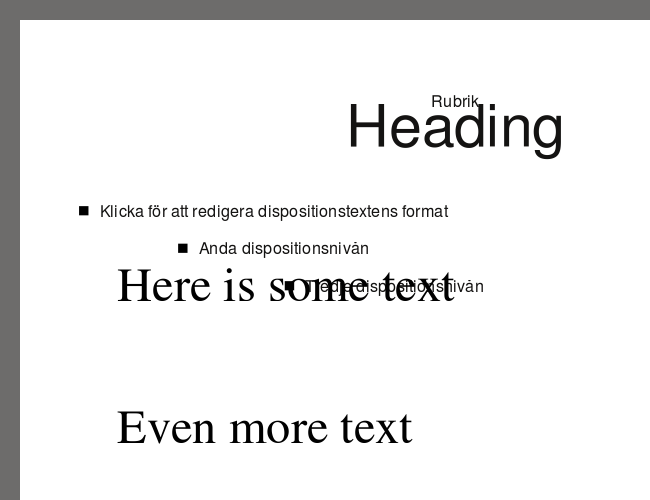 A few months ago I blogged about font rendering in KOffice. The problem has been discussed and analysed a lot on the last KOffice meeting and the KOffice forum. The conclusion was that the problem can’t be fixed inside KOffice, but needs to be fixed in Qt. Since the problem is far from trivial and we don’t have developers with experience in that specific area, we rely on Nokia to fix the problem. Problem has been reported in two bugs here and here. Unfortunately the bugs have very low priority at the moment, so we need to make clear to Nokia how much these fixes are needed. Everybody who is bothered about these rendering problems please vote on the two bugs I pointed out above. In case these bugs don’t get fixedm a possible plan B would be to switch the rendering to use Cairo + Pango. Till then you can try to work around the problem as I have pointed out in my old blog post. Jos wants Kivio. 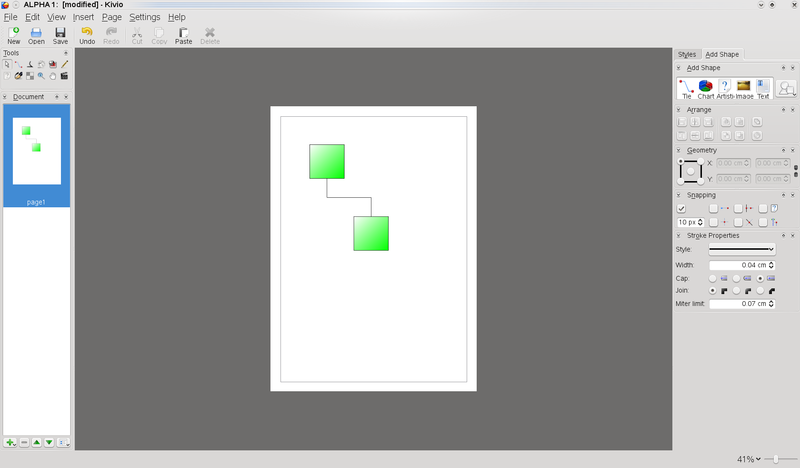 Do you want an easy to use diagramming and flowcharting application with tight integration into other KOffice applications too? Then this is your chance. This saturday 13th February, 9 am UTC there will be a meeting in #koffice on irc.freenode.org with everyone who wants to help to get the first version of Kivio for KOffice 2 finished. It doesn’t matter if you haven’t done KOffice development before, just come around and see what you can do. Last weekend I have been attending the KOffice Sprint is Oslo. Like every other KOffice sprint it was really cool and we had lots of fun. It was the first time I visited Norway and I really liked it. Unfortunately these sprints are always so busy that you don’t really see much outside the office. I arrived friday night at the airport, where I met Jos and Jos. During the travel to the city I could try the new N900, which is really a cool device. On saturday we had lots of interesting discussions about the lots of stuff. In contrast to the previous meetings many different things that are not directly technical issues in KOffice have been dicussed like the impending move to Git, release schedules, decision-making and the involvement of Nokia. Nokias testers did a huge amount of testing and I’m really looking forward to the development that will be done for KOffice 2.2. I got a N810 from Nokia and we had a lottery with five N900 as six month loan after dinner. Back at the hotel we had a Krita meeting, where we discussed the plans for Krita 2.2. For 2.2 we are mainly focusing on stability and performance with the midterm goal to get Krita ready for the next Blender open movie. To reach this goal we are running a fundraiser to get Lukáš Tvrdý, famous brush wizard of Krita, working full time on Krita for three months to improve performance, stability and usability. See more information is available on the Krita website. On sunday morning we had a discussion about getting KOffice end user ready. There is much to do to and even though it’s remarkable what this small group of developers achieves we still need more developers. So in case you want to help making KOffice ready don’t hesitate to drop by on IRC or the mailing list and we will get something for you. Big thanks go to Nokia, KDE e.V. and the organizers of this great sprint for providing the location, devices, food, accommodation and everything else that made this sprint such a great experience. As you might have seen on the dot, I took part in the ODF Plugfest in The Hague last week. The goal of the workshop was to improve interoperability between the different ODF implementations. All of the big vendors like Sun, Microsoft, IBM or Google, lots of smaller ones and open source projects like KOffice and Abiword attended. It was first time I was going to such a workshop and I had expected that there would be fights between the different vendors like it happened in some blogs before the workshop. It was a pleasant surprise for me that the athmosphere was very friendly and productive. It was really nice to meet other people projects/companys, put the competition aside for some time, work and drink some beer together. There were many interesting details in the talks for example there was a proposal get OpenFormula out once it’s finished to be available for ODF 1.1 before ODF 1.2 is completely approved. Other important things were that there is much interest to get more SVG functionality into ODF, to have a consistent documentation of different implementations and of course Officeshots. Officeshots is a very important tool, as it allows to test documents with many different implementations on many different platforms. The only downside is that MS Office not available on Officeshots at the moment. Over the two days many interoperability problems were found. One interesting issue we discussed on monday was a problems with some text appearing on the slide master in a presentation, a problem about that I wrote some time ago. What made this problem special that it’s probably the first problem that involves KOffice, OpenOffice and MS Office at the same time. A solution for the problem is currently investigated. In general the testing showed there is still a long way to go for everyone to get good interoperability. Interestingly KOffice was pretty well-kown by the audience. I got many questions about the KOffice Windows port, unfortunately the windows packages lag a bit behind. We gained lots of test documents from the testing and have started to look into the issues. One problem when loading of embedded charts in files from MS Office has already been fixed. Last but not least, I want to thank Michiel Leenaars, Fabrice Mous and everyone who organized this workshop. It was really great and I hope it will be repeated soon. As KOffice 2.0 is getting closer more and more people are testing it. If you have tested one of the beta releases you might have noticed that a lot of documents don’t look in KOffice like they look in OpenOffice. I’m aware that the KOffice ODF implementation doesn’t support all of ODF at the moment and that there are bugs, but in the last few months I noticed a totally different type of ODF problem is getting more and more important. The problem is that with the increasing number of ODF editors more and more issues show up where the documents are interpreted differently. I saw an article on Joel on Software which explains the current situation and the way how got there pretty good. While the current ODF situation can’t be compared with HTML (Users don’t write the documents themself, so the number of incompatibilities is limited), the problems are similar. For both there was for a long time a one-to-one market with a domiant product, which defined a pragmatic standard. Now new players show up no matter if it’s Firefox and Webkit for HTML or KOffice etc. for ODF and an like the old claim “Everything has to look like in IE” we now have to deal with “Everything has to look like in OpenOffice”. Many users say that there is ODF which is an open standard and we just need to implement it and are compatible to OpenOffice. In theory that is correct, but in practice bugs and misinterpretations make it difficult (Though a it’s much better than between IE and Firefox). Recently we had such a case: Bug 185354. 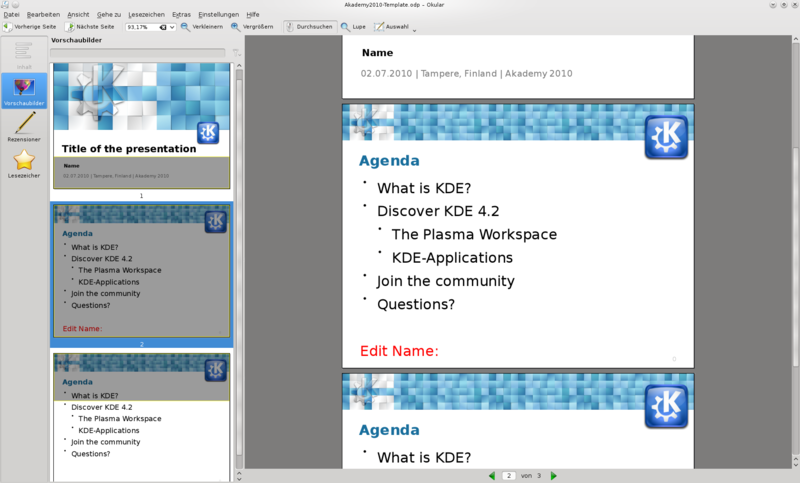 Basicly the problem is that KPresenter shows some text in the background that’s not there in OpenOffice. For the user the it looks like a bug in KPresenter, as the text wasn’t there when editing in OpenOffice and “appears from nowhere” in KPresenter. 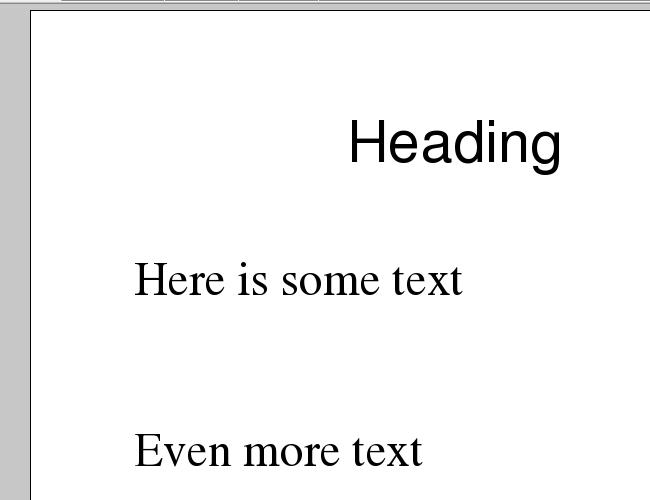 Actually it’s a bug in OpenOffice (scheduled for 3.2), where OpenOffice doesn’t mark the the text as placeholder so KPresenter loads it at normal text. There was a discussion if we add a workaround (which is hard to do, because we would need to implement the internal magic from OpenOffice) or if we should be more strict. The biggest argument is that OpenOffice is currently dominant on the ODF market and we need to be compatible to get any user to use KOffice. At the same time we can see on HTML and the MS Office formats were that could lead. ODF supporters tend to laugh about things like the Excel year 1900 bug, but everyone should be aware that we could end up in similar cases if we don’t pay attention. One problem is that there is not real reference implementation of ODF, so users can’t even decide which programm renders the document correctly. Also the OpenOffice team is doomed to keep everything the way it currently works, because changing anything would upset the users even if it’s better in the long-term (Fortunately this bug should be fixable without breaking anything). There a few more problems like this, but I hope they will be solved sooner or later. Still ODF is the best format that’s available at the moment. You are currently browsing the archives for the KOffice category.